Salman Khan is my angel. HomePalak MuchhalSalman Khan is my angel. 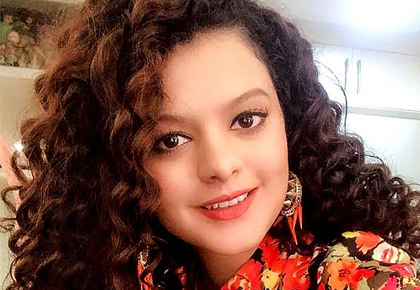 Palak Muchhal, 26, has sung some of Bollywood's biggest hit songs like the title track of Prem Ratan Dhan Paayo and Tum Hi Ho from Aashiqui 2, in her decade-long career. And she thanks her angel Salman Khan for giving her her big break. The singer, who recently launched an app, which allows her to interact with fans on a personal level, lists her favourite songs and also sings for us. She tells Rediff.com Contributor Mohnish Singh, Whenever a new song comes up, I wonder whether it will be accepted, but every song ends up being a hit. I realised it has been a decade when I got the The Favourite Singer of the Decade' award recently. Yeah, it has been a decade and the journey has been amazing. I had never thought I would come so far. I had thought I would sing one or two songs after coming to Mumbai and doing my bit of struggle. But when I came here, the first person I met was Salman Khan sir. Since then, there was no looking back at all. I managed to sing so many songs in these fantastic years. Whenever a new song comes up, I wonder whether it will be accepted, but every song ends up being a hit. There are so many adjectives I can use for him, but my favourite is 'angel'. Also, godfather and mentor. When I came to Mumbai, I did not know anybody. I met him and he told me I would be singing in his film soon. And he lived up to his promise. If I have to make any important decision in life, I consider his opinion after my parents. He has guided me at every step of my life. He will always tell me what is right and what is wrong. His contribution in my life is not limited to just him recommending my name for songs, it is beyond that. So, I am really grateful.